Heroes of the Storm has been going through a lot of changes lately, some small, some the size of a gigantic two-headed ogre. There’s one change that’s disturbed me more and more the more I think about it. They added KDA ratios into the game. Oh god, the KDA ratio! Takedowns combined kills and assists into one big number. As you can see, doing so intentionally blurs the information immediately available to players. All you can see looking at this score screen is: everyone’s takedown score, and then the final kill score. There’s no way I (playing as The Butcher, the name outlined in yellow there) could have gotten 16 kills while my ally Kael’thas got 14 if our team’s final kill count was just 22. And that was the point: you couldn’t assign full credit to a single person for a kill, or see where exactly each kill in the final team score came from. In turn, you couldn’t apportion blame with an arbitrary standard. This old system made much more sense for Heroes of the Storm, given the game’s peculiarities as a member of an already peculiar genre of games. One of the biggest differences between HOTS and the two other big PC MOBAs (League and Dota 2) is that it apportions experience on a team-wide level. Experience for kills, experience for destroying enemy buildings, experience for farming minions—everything is shared equally by the whole team. Everyone on a team therefore levels up at the same time and thus unlocks their different upgrades and abilities simultaneously. Takedowns fit perfectly within this design philosophy. Just like everything else in HOTS, they are shared by all the players involved in executing a kill (or several). The system was a tad janky—sometimes it would award me with kills when I didn’t do anything in a situation. Like: literally nothing, I’d just be standing nearby, doing something completely different, when an ally assassin would suddenly pounce on some unsuspecting opponent a few feet away. Problems aside, the in-game takedown rewards were consistent with everything else about how Blizzard frames HOTS matches. In League and Dota, experience is handled in the complete opposite way. You only get experience for your direct kills, or direct assists, which reward much less xp than kills. For better or worse, this system encourages people on a League of Legends team to play selfishly. Even when working together as a team, you have to make sure that you’re securing yourself a substantial enough chunk of xp to be able to keep playing. This dynamic is so overbearing in League that players regularly argue with each other over “kill steals,” or KS—separate teammates each insisting that they deserved to get that last kill, or if you want to be a real troll, actively trying to deny your teammates kills. At the same time, there are merits to individual XP that justify the ubiquitous presence of KDA ratios in League of Legends. 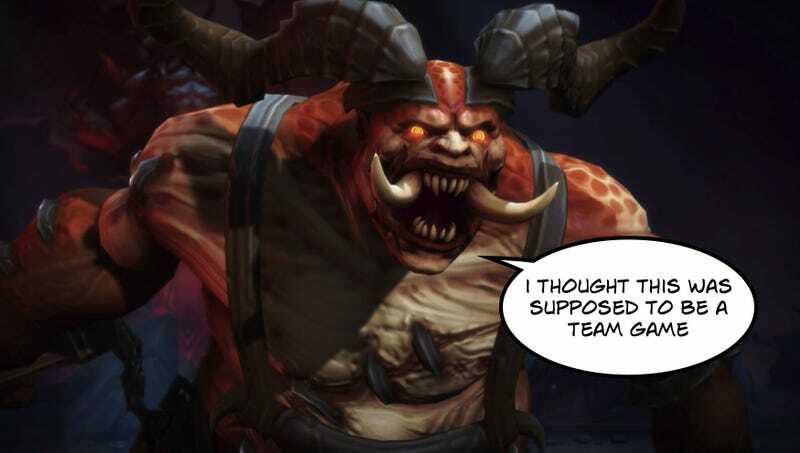 I could argue that isolating each team member’s experience actually helps motivate them to play their best and keep up with the rest of the team, the same way I could argue that sharing XP in HOTS motivates everyone to work together rather than keep looking out for their number one. It’s a surprisingly familiar debate about the merits of different economic systems and how they influence those working within. Ultimately, League and Heroes are different games. I can’t render any judgement more definitive than that. What I can say, however, is that KDA ratios actually make sense for League of Legends because they fit within the game’s overall design philosophy. Knowing someone’s KDA is legitimately useful information in League, especially when it comes to the professional tournaments and high-level ranked player—i.e., places where players benefit from having this data at their fingertips. The deleterious effects that KDA ratios have on League of Legends’ community are thus balanced against the good things that such information provides. From the very beginning, Blizzard has insisted that it’s doing something different with Heroes of the Storm. Something new and exciting that’s meant to shake up people’s assumptions about the MOBA genre. And what’s really and truly awesome about the game is that it has done that. Any HOTS fan who’s come from another MOBA will tell you that they feel like the shared experience, along with many other factors, helps incentivize teamworks by instilling everyone with a sense of: Hey, we’re in this together. It really shouldn’t matter who’s responsible for what kills, because these data points don’t even matter thanks to the game’s innovative design. Heroes of the Storm is at its best when it strikes out on its own and doesn’t try to make itself fit within the genre confined=s that League and Dota 2 have so successfully established. Adding KDA ratios to HOTS is not that. It’s a strange appeal to a foreign system that doesn’t have a real place in Blizzard’s game. You know what I’d much rather see in Heroes of the Storm than KDA ratios? More things like Cho’Gall, the genre-defying new hero who’s controlled by two different players at the same time. Let’s keep adding new mechanics that encourage people to play together and cooperate with one another, rather than players more tools to separate themselves from one another.